Red Iguana • Celebrated eatery’s success draws on its “think tank” — cooks with first-hand knowledge of Mexico’s culinary heritage. 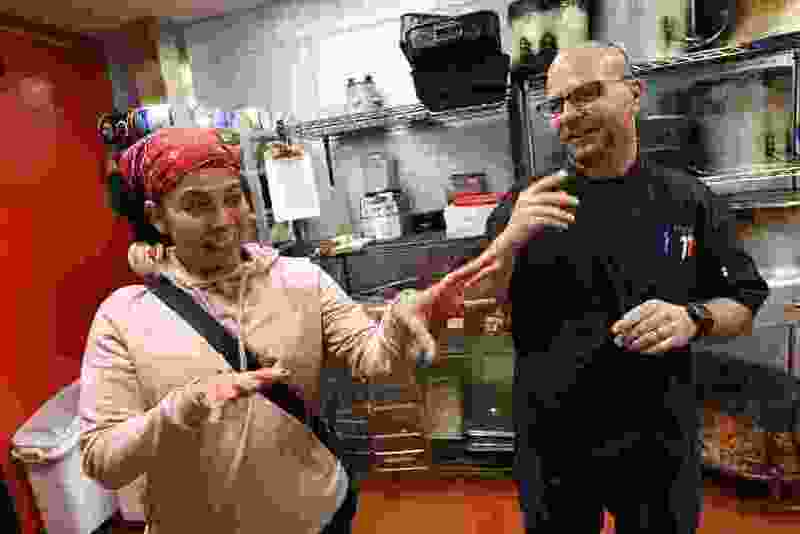 Francisco Kjolseth | The Salt Lake Tribune Red Iguana owner Lucy Cardenas jokes around with kitchen manager Matthew Hewitt behind the scenes in their newly remodeled kitchen at Red Iguana 2. The popular eatery may be Utah's most decorated restaurant, winning both local and national awards for its "Killer Mexican Food." The dining world glamorizes the personality-driven restaurant, the one with the chef's name above the door and his or her signature dishes on the menu. It's not the only road to success, though. Salt Lake City's Red Iguana restaurant group is a good example. Few may realize that Utah's most recognized dining establishment — featured in The New York Times, showcased on The Food Network and included on Top 10 lists everywhere — operates with a well-orchestrated group of eight lead cooks, but no executive chef. "It's a team effort," explains co-owner Lucy Cardenas. 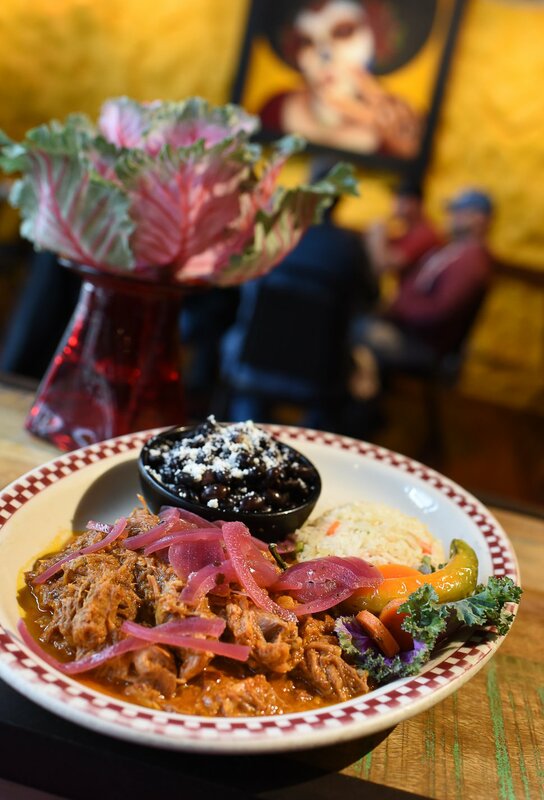 The six men and two women are in charge of preparing all the Red Iguana specialties, from the rich moles and chile verde to the popular cochinita pibil — slow-roasted pork rubbed with achiote, orange juice and spices. 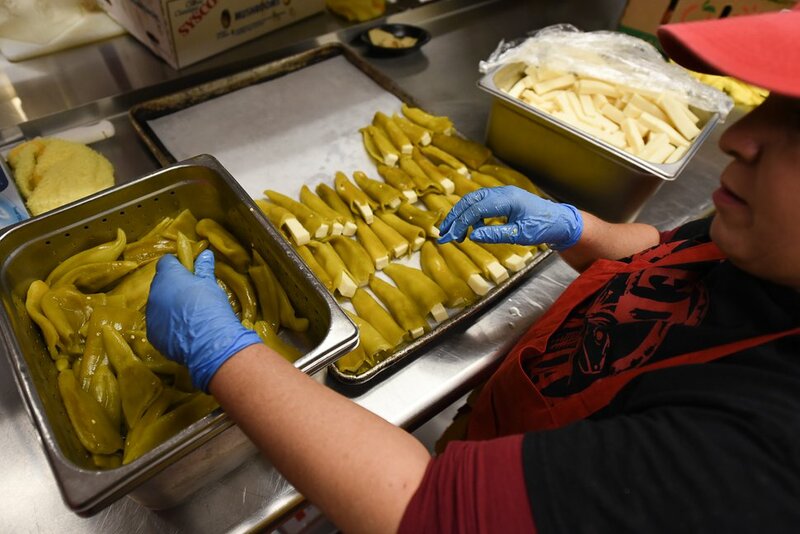 The system keeps the Cardenas family recipes alive — and consistent — as the business expands and employees come and go, says Cardenas, who along with her husband, Bill Coker, purchased the business from her parents, Ramón and María Cardenas, in 2005. Some of the lead cooks have been with Red Iguana more than a decade; the newest member has been on board less than six months. All were born in Mexico and are encouraged to bring the flavors of their specific home regions to the restaurant, explains Matt Hewitt, the director of kitchen operations. "They are the heart and soul of the restaurant," he said, referring to the group as a sort of "think tank," sharing their oral and culinary traditions and inspiring new dishes that show up as daily specials, at catered events or to the already diverse menu that pulls from all parts of Mexico's culinary heritage, from Baja to the Yucatán. Consider the beef barbacoa special recently, a dish created by Nancy Najera, who was born and raised in Guerrero, a city near Acapulco. The 37-year-old has been a lead cook for six years after working a year as a prep cook. While she has always been passionate about food, she has "been learning a lot" as a lead cook. "It's a good team," she said through an interpreter. "Everyone has a good time, but also works really hard." History • The lead cooks are continuing the roots that were established in 1965 when Ramón and María moved from San Francisco and took over the Casa Grande restaurant in downtown Salt Lake City. It was a classic family business as their children — Lucy and Ramón Jr. — washed glasses, seated customers and learned duties in the kitchen. Casa Grande operated successfully for some 15 years until urban blight and the recession hit. That's when Ramón opened a small, four-table restaurant on Salt Lake City's west side and called it Red Iguana. It did well and the family was able to close the ailing Casa Grande. A fire burned the Red Iguana in 1986 and it was moved to its flagship spot at 736 W. North Temple, where it quickly developed a cultlike following. In 1998, María's health began to decline and she needed full-time care from her husband until her death in 2002. At that time, Ramón Jr. took over as executive chef. While the current eight-cook kitchen structure seems brilliant now, it was born out of tragedy and necessity. In 2004, Ramón Jr. died unexpectedly of a brain hemorrhage at 42. At that time, many customers, employees — and even some within the Cardenas family — worried if the restaurant would be able to continue. "We had never written down the recipes. 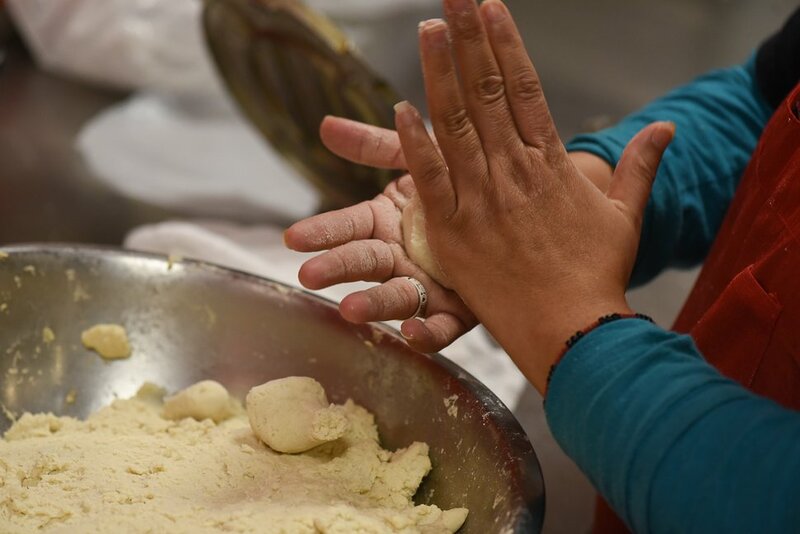 My brother just had them in his head," said Cardenas, who forced her father to come out of retirement and help her reconstruct the recipes, this time writing them down. Ramón Sr., now in his 80s, still comes in regularly, says his daughter. "He tastes and checks in with customers and gives it a thumbs up or thumbs down." Recent changes • There will usually be a long line along North Temple to get a table at Red Iguana. Its slogan, after all, is "Killer Mexican Food That's Worth the Wait." It's also one of the reasons Cardenas and Coker opened Red Iguana 2 in 2009, just a few blocks away at 866 W. South Temple. A third Salt Lake City location, Taste of Red Iguana at the City Creek Center food court, came in March 2010 when the downtown mall opened. Between the three restaurants, Red Iguana employs 170 people and averages at least 1,000 customers per day, Cardenas said. Improvement continued in 2015. Red Iguana 2 recently added a large dining room with a 13-seat bar and an outdoor patio. The area seats more than 100 people and includes large tables to accommodate big groups. "It's cut down the wait time at both restaurants," said Cardenas. The kitchen was expanded as part of the remodel, and now the restaurant is making its own corn tortillas, an item that was previously purchased. Cardenas said the expanded kitchen and the lead-cook system create creativity and stability for the future. "We want to keep the traditions, but also continue to improve," she said. "The goal is to keep this going as long as we can and continue to do what we do well." 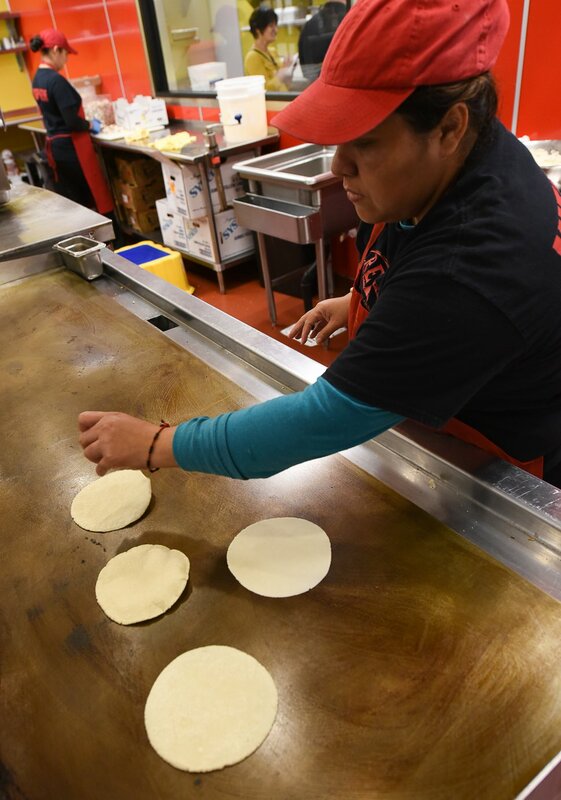 Francisco Kjolseth | The Salt Lake Tribune Rubicela Garcia makes corn tortillas by hand at Red Iguana 2. One of Utah's most decorated restaurants, winning both local and national awards for its "Killer Mexican Food," has recently expanded their kitchen and dining space. Francisco Kjolseth | The Salt Lake Tribune With a focus on tradition and legacy the poplar Red Iguana 2 is now able to accommodate large parties following a recent remodel. 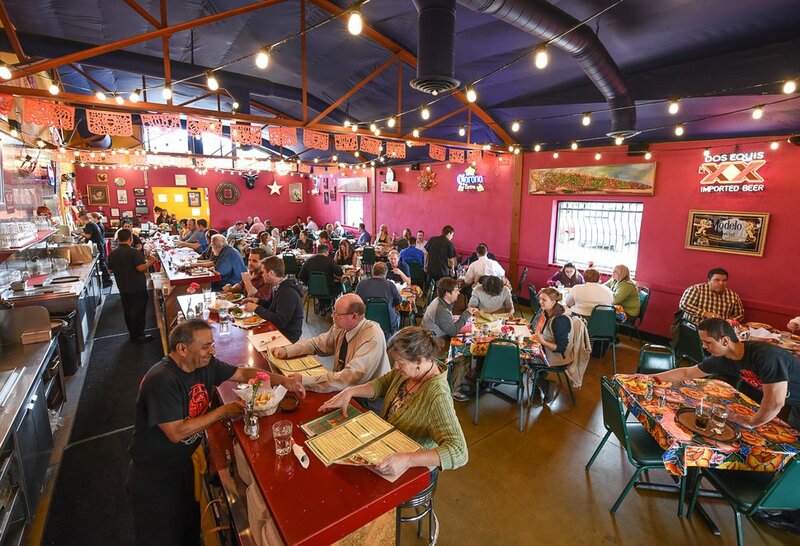 Red Iguana is one of Utah's most decorated restaurants, winning both local and national awards for its "Killer Mexican Food." 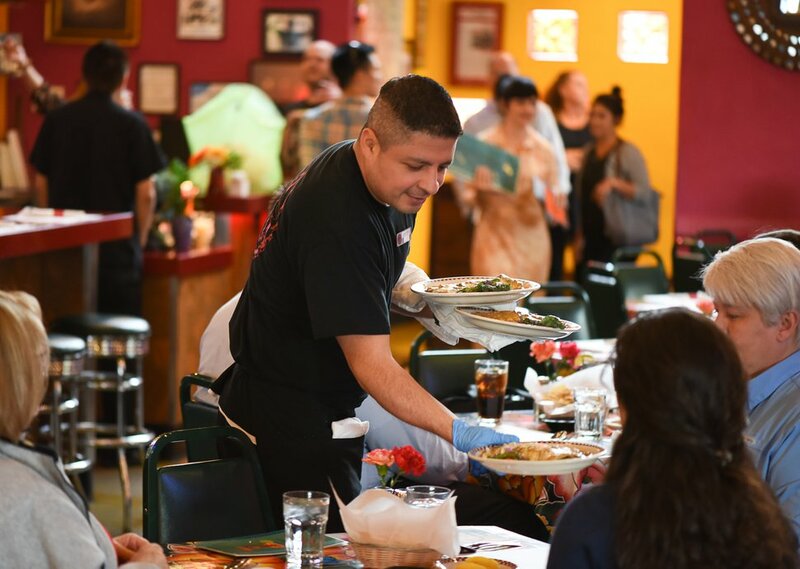 Francisco Kjolseth | The Salt Lake Tribune Ernesto Rodriguez serves guests at Red Iguana 2 during a recent lunch rush. Utah's most decorated restaurant, winning both local and national awards for its "Killer Mexican Food." is unlike many restaurants where a single chef is calling all the shots. Red Iguana has a kitchen manager, Matthew Hewitt, and a team of 8 lead cooks that have mastered the sauces and other recipes. Francisco Kjolseth | The Salt Lake Tribune Rocio Leal assembles chile relleno's in preparation for the day's crowds at Red Iguana 2. 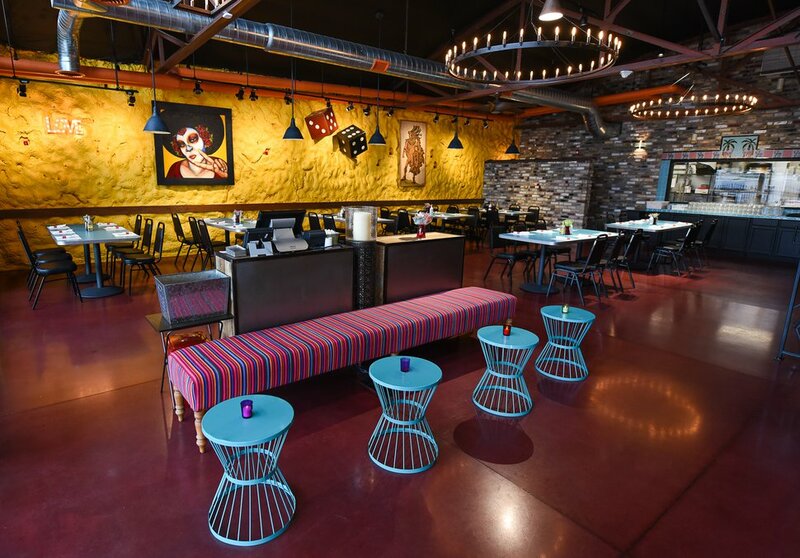 One of Utah's most decorated restaurants, winning both local and national awards for its "Killer Mexican Food," Red Iguana 2 has recently expanded their kitchen and dining space. 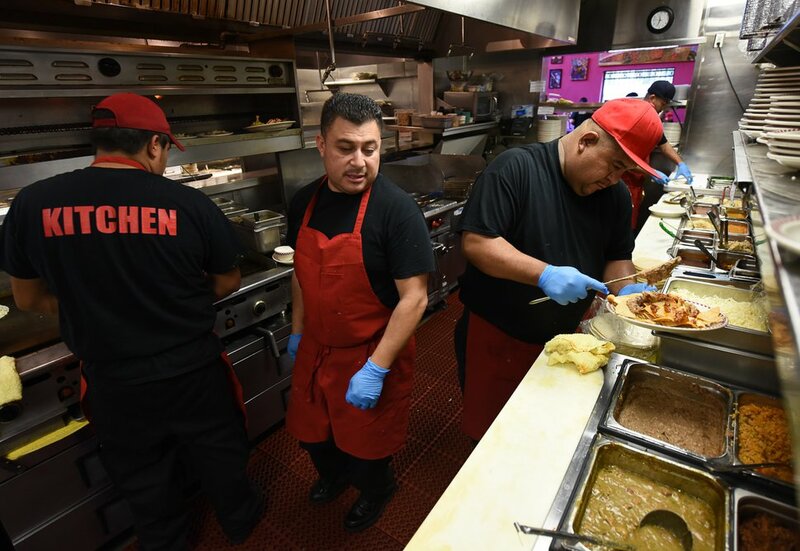 Francisco Kjolseth | The Salt Lake Tribune Chefs Jose Pacheco, center, and Teo Bahena, right, are in constant motion as they stay on top of a recent lunch rush at Red Iguana 2. Unlike many restaurants where a single chef is calling all the shots, Red Iguana has a kitchen manager, Matthew Hewitt, and a team of 8 lead cooks that have mastered the sauces and other recipes. 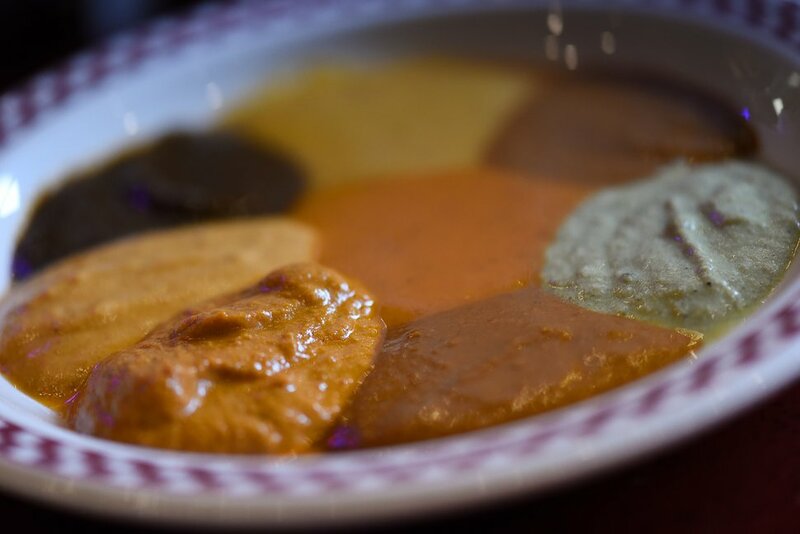 Francisco Kjolseth | The Salt Lake Tribune A sample plate of multiple types of mole at Red Iguana 2 give customers a chance to make a more informed decision before they order. Unlike many restaurants where a single chef is calling all the shots, Red Iguana has a kitchen manager, Matthew Hewitt, and a team of 8 lead cooks that have mastered the sauces and other recipes. Francisco Kjolseth | The Salt Lake Tribune Red Iguana may be Utah's most decorated restaurant, winning both local and national awards for its "Killer Mexican Food." One offering full of flavor, not normally served at Mexican restaurants is the Cochinita Pibil - pork loin rubbed with achiote, vinegar, lime juice, orange juice, paprika and salt, slow roasted, then shredded and simmered in the roasting juices. Francisco Kjolseth | The Salt Lake Tribune Red Iguana may be Utah's most decorated restaurant, winning both local and national awards for its "Killer Mexican Food." 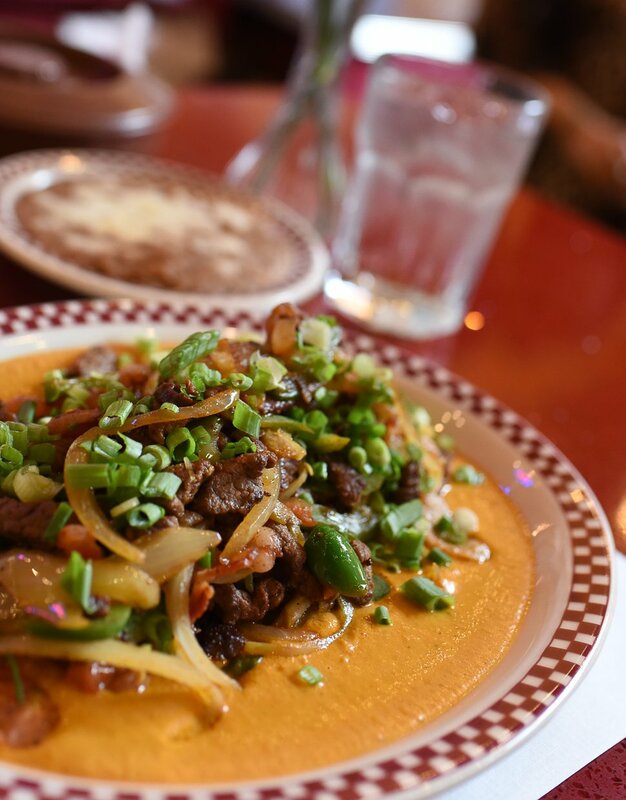 One offering full of flavor is the Puntas de Filete a la Nortea - top sirloin tips sauted with bacon, jalapeo strips, onions and fresh tomatoes, served atop almond mole. 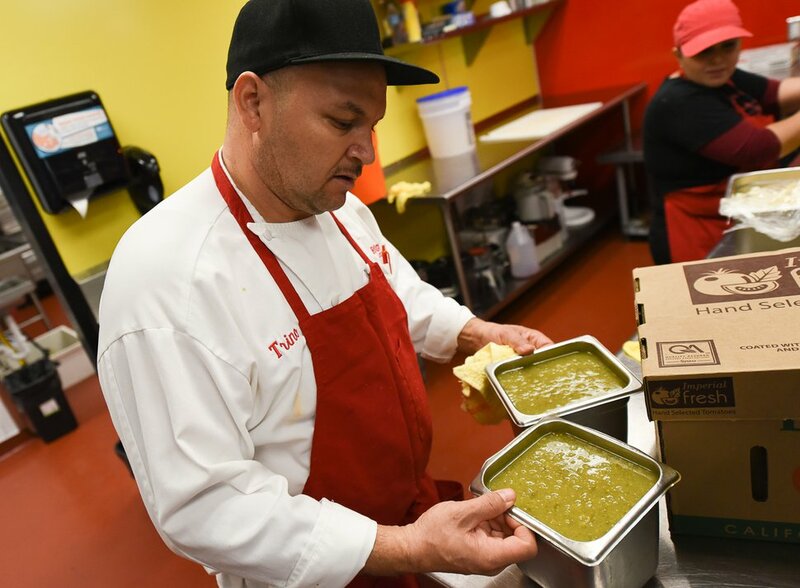 Francisco Kjolseth | The Salt Lake Tribune Trino Camarena, one of 8 chefs at Red Iguana, prepares salsa verde for the day's rush recently. Unlike many restaurants where a single chef is calling all the shots, Red Iguana has a kitchen manager, Matthew Hewitt, and a team of 8 lead cooks that have mastered the sauces and other recipes. Francisco Kjolseth | The Salt Lake Tribune Red Iguana may be Utah's most decorated restaurant, winning both local and national awards for its "Killer Mexican Food." At Red Iguana 2 in Salt Lake City, the lunch crowd fills the seats as staff prepares a table for those waiting to get in.